When it comes to a video format, MP4 may first come into your mind since this MPEG-4 Part 14 file format enables you to limitlessly access to almost all media players. However, even though such multimedia container is near-perfect, there still has something to improve. Although MP4 is based on Apple's QuickTime technology, its data embedded in this MPEG-4 Part 14 file, like MPEG-4 Part 10 (known as H.264/MPEG-4 AVC), MPEG-4 Part 2, etc, causes a codec problem which doesn't work well with Apple products. To edit these MP4 videos in iMovie or play MP4 on iPhone, iPad, iTunes, etc, you'd better convert MP4 to MOV on Mac first as MOV is the default format of macOS and performs optimum compatibility with Apple devices (iMovie, iTunes, QuickTime Player, iPhone, iPad, Final Cut Pro, etc). 1. It's support for Intel QSV, Nvidia Cuda, AMD hardware acceleration makes it the fastest free converter in the market, offering 5x faster speed. 2. The Auto Copy feature is similar to remux tech, allowing you to convert MP4 videos to MOV when both formats use H.264 codec. It will deliver intact video quality with even faster speed. 3. The trimming, cropping, compressing, upscaling, and parameter adjustment features are extra bonuses. After the MOV encoding task is finished on Mac with the above free MOV conerter, you may want to transfer the MOV files to other Apple devices like iPhone and iPad. 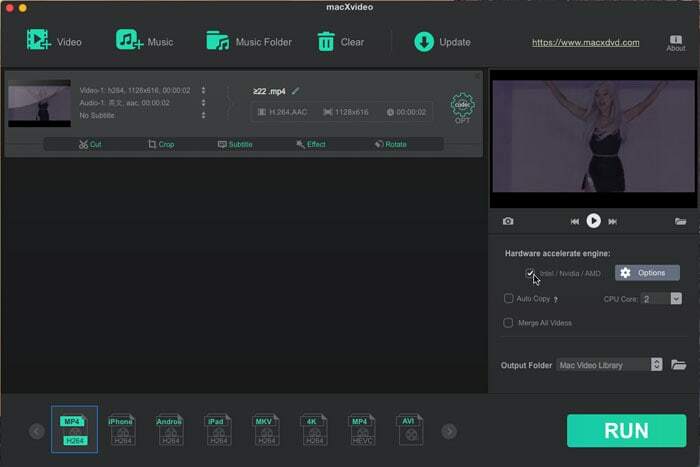 The MacXDVD's super star product - MacX MediaTrans to transfer MOV video from Mac to iPhone X/8/7/Plus, iPhone SE, iPhone 6s/6/Plus, iPad Pro, iPad mini/Air series, iPods, as well as backup video, music, photos and more from iOS iPhone iPad to Mac computer. Free download MP4 converting freeware on Mac, install and run it, import MP4 video by clicking "Add File" button. To decode MP4 videos to MOV on Mac, select "MOV" as output format. The optimized default settings ensure the best output quality. If you need MOV videos for editing in iMovie or playing on QuickTime, iTunes, iPhone, etc, you can select the specific presets from the list directly. Note 1: On the interface, please don't forget to check the Hardware acceleration engine and Auto Copy boxes. As mentioned above, the two features will help accelerate the whole mp4 to mov conversion when possible. Note 2: Here you can see the editing features below the video information. Click any button on the bar to enter into the editing window, where you can cut, crop, add subtitles, add effects, rotate videos and etc. Note 3: The gear icon stands for the parameters settings where you can adjust the bit rate, resolutions, frame rate, codecs etc. 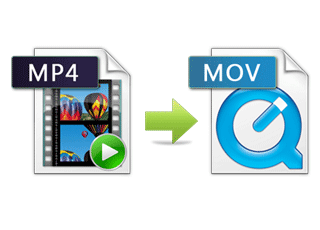 Click "RUN" button to start MP4 files to MOV conversion with this free MP4 to MOV converter tool. You can view the conversion progress and are able to cancel the process at anytime. With this utility in handy, a few mouse clicks will decode file on Mac at no cost. MP4 is nowadays an industry standard format which is the extension for MPEG-4 Part 14 in essence. It is a media container that contains digital video, audio streams, subtitles, still images and other data. It will also store advanced data like 3D graphics and UHD videos. This format has a very efficient compression method that makes it easier to be distribute among web and different devices. MOV is a QuicTime file that applies proprietary compression algorithm developed by Apple. It's also a media container that uses tracks to hold data like video, audio, text, etc. Generally, MOV is a high-quality file format and the MOV videos will be larger than MP4. Check MOV VS MP4 for more detailed info about the two formats. This MP4 to FLV tutorial shows you top easy ways to fast convert MP4 to FLV on Mac/PC with the best program for sharing on Facebook, Twitter and other online video sites. Need help in decoding MP4 to AVI on Mac? Read our how-to guide to convert MP4 to AVI on Mac without losing quality in fast speed, using best MP4 to AVI converter for Mac and online programs. iMovie won't let you import MP4 files? Easy solution is to transcode MP4 to iMovie supported H264/MPEG-4 and AAC codecs. Thus, you can add MP4 into iMovie for editing. MacX Video Converter Free is a fantastic video processing freeware to free convert video to MP4 for playback on iPhone iOS Mac computer. It also functions perfectly among SD and HD video conversion, like AVCHD to MP4, MKV to MOV, WMV to MP4, FLV to AVI, MP4 to MP3, etc.